Greetings everyone! If you follow my twitter you might know that I just spent some time on retreat to Plum Village in France, learning about the teachings of one of my heroes, Thich Nhat Hanh. I’ve taken away so many great lessons from this trip, and I can’t wait to explore it all with you guys in the coming posts. In the meantime, here’s the final instalment about the Eightfold Path. In the last two posts, Wisdom and Ethical Conduct, I have talked a lot about the practical applications of each step. With Mental Development, the focus is more about all the work that happens behind the actions. Having Right Effort means cultivating the self-discipline needed to follow through with the Eightfold path and other teachings of the Buddha. It’s not always easy to do the right thing. Indeed, in a lot of cases, doing the wrong thing is easier. It’s easier to steal something than to earn it. It’s easier to exploit the weak rather than fight the strong. However, although doing these things can lead to short term gain, in the long run it cannot last. If you steal you could be caught and punished and if you selfishly continue to exploit those around you, you will be resented or eventually run out of vulnerable things or people to take advantage of. In time, you will become more and more insensitive to your negative impact on others as desire, envy, aggression and perhaps even violence takes over. Instead, you have to learn to encourage your positive mental states, such as honesty, benevolence and kindness. As long as you put in the Right Effort to be compassionate towards others, your practice of the other steps such as Right Speech, Action and Livelihood will be fuelled by your positive energy. 1. To prevent the arising of unarisen unwholesome states. In other words, try not let yourself get angry or hurt so easily. You have full control over these emotions, it is not others that upset you, it is you who allows them to. 2. To abandon unwholesome states that have already arisen. If you do find yourself getting angry, it is best not to act immediately. Instead, take a moment to breathe, and you’ll find that a lot of your anger will dissipate quickly. Your mind will become clearer and you can make better judgements about how to handle the situation instead of making it worse. 3. To arouse wholesome states that have not yet arisen. The third step is to intentionally be compassionate towards others. Smile and complement people, even strangers. Give generously to others, whether it is your material resources, time or effort. 4. To maintain and perfect wholesome states already arisen. Avoid lying as much as you can. Either keep promises, or don’t make ones you can’t fulfil. Be patient and forgiving. Listen deeply to your family and friends and love them unconditionally. Right Mindfulness is simply the ability to see the world clearly as it is. We should try to clear our minds of delusion and judgement, because they lead to discrimination which inevitably leads to hurting others. We may only be half conscious of it, but we spend a lot of mental energy categorising, interpreting and distorting things. We fail to recognise the importance of some issues or blow others out of proportion. When our view is being obscured we don’t see the other side’s perspective. We don’t realise that there must be a reason why people do or think in certain ways, if it is not ‘our way’ it doesn’t mean it’s the ‘wrong way’. Right Mindfulness enables us to be aware of ourselves and the world around us. It doesn’t stop or make us do anything, instead it is just the non-judging acknowledgement of our thoughts and actions. When we know we are doing something hurtful or helpful, Right Intention and Right Effort will guide us to stop or continue our actions. Practising Right Mindfulness builds a mind of tranquillity and equanimity. You will find yourself much more emotionally stable and with a much better ability to remain composed under tension or stress. The best way to practice is simply just to sit down in silence and close or half close your eyes. Once you stop moving your body and stop being distracted by information going into your eyes and ears, you can think more clearly about things the things that are on your mind. 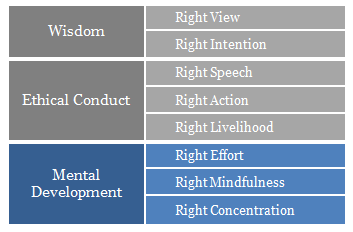 Right Mindfulness (combined with Right Concentration) leads to insight. With clarity of conciousness, almost anything can happen. You may find a solution to a problem or make an important observation about a relationship, your past actions or realise that things aren’t as bad as you had thought. If you sit regularly and patiently, you will experience the miracle of mindfulness. Right Concentration is developing the ability to direct all of your mental energy towards a single object and maintain that focus for a period of time. In the context of the Eightfold Path, it means concentrating on wholesome thoughts and actions such as those under Ethical Conduct – Right Speech, Action and Livelihood. It might be very difficult at the beginning to maintain focus and not be distracted by all the things going on around us. But what most people don’t know is that concentration is a skill, just like tennis – nobody is naturally born already amazing at it, they have to learn the techniques and practice consistently. The best way to learn is, again, to practice meditation. I cannot emphasize how important this is. You don’t have to go on retreats, the Dalai Lama himself says you don’t have to be vegetarian, but meditation is an essential component to Buddhist practice. Even if you do not wish to be Buddhist or a Buddhist practitioner, meditation (like eating healthily or taking up yoga) is immeasurably beneficial to everyone. One way of practising Right Concentration is to try, for 20 minutes, in whatever you are doing, to pour your entire concentration into doing it. Immerse yourself. Don’t stop until you are done with the task at hand or 20 minutes are up. Try to ignore or postpone any distractions until you have finished. If you can do this, try it again for an hour, a day or even a week. You will find that you are able to complete the task not only more quickly, but with better quality. Each person has enormous amounts of concentration within them, which also means each person has huge potential to achieve great things. Unfortunately, it gets spread out and diluted as we allow things to distract us from our goals. Concentration is a powerful tool. Being present and focussed is the difference between being a participant of life and being and merely being an observer. It’s taken me a little while to write these posts, partly because I was busy preparing for my travels but partly because although the Eightfold path is a simple concept, it is complex in it’s teachings. There’s so much to say (believe me, I read a lot of literature before writing these posts) but the most important point of all is not just reading about the theory but the actual practice of the path itself. These posts have been an introduction, a guideline, a gift from me to you. However, it’s up to you now to choose where to go from here. Remember the saying? “Imagine what you could achieve if you put your mind to it”. Now, you don’t have to imagine. May the Eightfold path lead the way! This entry was posted in Zen Buddhism on July 26 2012 by Jessica.